MPG-o-Matic 2012 Hyundai Accent Review Summary: The newly refreshed 2012 Hyundai Accent goes to battle in the highly competitive sub-compact class against fuel-efficient rivals including: the Ford Fiesta, Chevy Sonic, Fiat 500, Honda Fit, and cross-town cousin Kia Rio. The Accent plays the value card, with an entry price of just over $12,500. While the base GLS sedan is spartan, the fully-equipped SE hatchback is kitted out with features you might not expect with a MSRP under $16,000. The 2012 Hyundai Accent is powered by a 16-valve Gasoline Direct Injected (GDI) 1.6-liter inline four-cylinder engine producing 138 horsepower (HP) and 123 foot pounds of torque. A six-speed manual transmission is standard and a six-speed automatic is optional. The Accent is offered as a four-door GLS sedan and five-door hatchback models with two levels of trim: GS and SE. The official fuel economy estimates for the 2012 Accent are 30 city / 40 highway miles per gallon (MPG) for both the manual and automatic. We traveled more than 300 miles in our top-of-the-line manual-equipped Electrolyte Green SE five-door review unit (sticker priced at just $15,795) and nudged past the official mileage estimates, with an average of 42.7 MPG on the Interstate highway and 36.6 MPG combined with spring temperatures ranging from the forties through the seventies. Interstate highway testing temperatures were in the fifties. Our SE hatchback test vehicle was equipped with the standard 16-inch alloy wheels, clad with Kumho Solus KH25 P195/50R16 grand touring all-season tires, and was delivered with slightly over 8300 miles on the odometer. The Kumho Solus is not rated as a low-rolling-resistance (LRR) tire. Tire Rack does not currently list any low-rolling-resistance tires in the P195/50R16 size. The GLS and GS models are fitted with 14-inch steel wheels, clad with Hankook Optimo H724 Standard Touring All-Season P175/70R14 tires. The Optimo H724 is not a LRR tire. Michelin has two P175/70R14 low-rolling-resistance tires: the Defender standard touring all-season and Michelin X-Ice Xi2 studless ice & snow. Highway driving range is good. 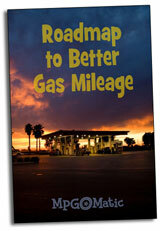 The 2012 Accent is fitted with a 11.4 gallon fuel tank and is designed to run on regular unleaded gasoline. 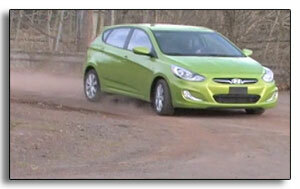 All 2012 Hyundai Accents are fitted with four-wheel-disc brakes (10.1-inch vented front/10.3-inch solid rear). Curb weights run from 2,396 pounds (GLS manual) through 2,654 pounds (GS and SE automatics). The Accent’s 1.6-liter GDI four delivers a sprightly run up to sixty miles per hour. The center-mounted monochrome display provides trip meters, range to empty, average and instant fuel economy data, along with an handy upshift light while in Eco mode. The Accent SE is equipped with “sport-tuned steering,” which is not available on the GS or GLS models, and is fun to whip about, as it goes to battle against a class full of go-karts, including the Fiat 500, the Ford Fiesta and Chevy Sonic. Inside the cabin, the techie touches are tipped off with a digitally-inspired cloth upholstery. 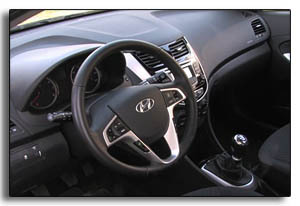 The driver’s seat provides six-way manual adjustment. Adjustable lumbar support and heated seats are not available. The SE model includes a leather wrapped shift knob and steering wheel with integrated audio controls and hands-free Bluetooth (both are optional on the GLS and not available on the GS). The 172-watt six-speaker audio system includes XM satellite radio and iPod integration, with a monochrome display somewhat reminiscent of the early-gen iPod interface. A single twelve-volt outlet is located at the base of the dash next to the USB and audio inputs. The Accent hatchback provides 37.8 inches of headroom and 33.3 inches of legroom. There’s slightly less space for taller folks in the sedan (37.2 inches of rear seat headroom). The Accent five-door allows for 21.2 cubic feet of cargo area with the 60/40 split-folding rear seat up and 47.5 cubic feet of storage when folded down. The GLS four-door sedan’s trunk provides 13.7 cubic feet of storage. While the GLS sedan has an admirably low Manufacturers Suggested Retail Price (MSRP), the standard amenities are spartan. The GLS option list includes: power windows, air conditioning, cruise control, power side mirrors, and remote keyless entry. All-in-all, the 2012 Hyundai Accent isn’t just one of the most affordable and practical vehicles available today … the manual-equipped SE hatchback is genuinely fun to drive. With a starting price of just over $12,500 (for the basic GLS Sedan), excellent fuel economy, and a robust warranty program, the Accent plays the trump card with total cost of ownership.